Where can I get two color vinyl PVC fence? 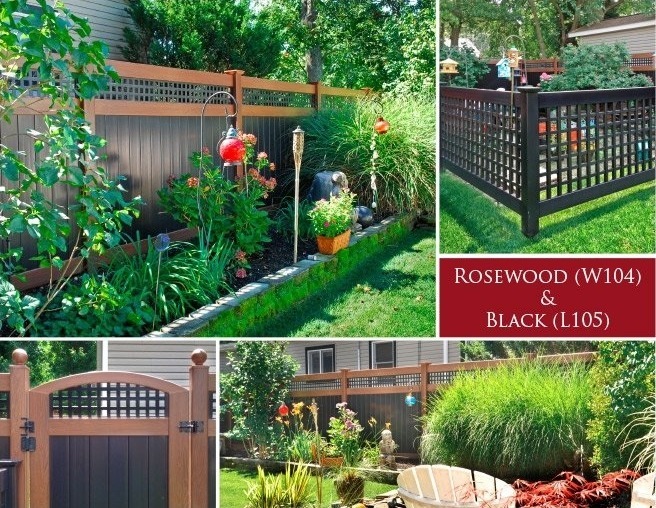 Where can you get a two color vinyl pvc fence? Right here with this Grand Illusions Rosewood and Black. So, your customer wants the look of painted wood, but doesn’t want the maintenance? 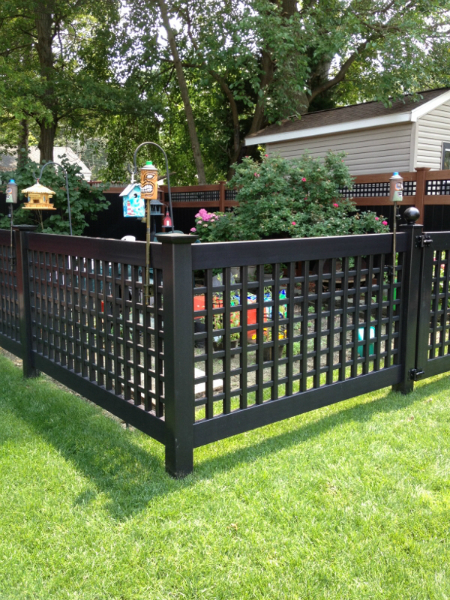 Take a good look at the above pictures of woodgrain and color vinyl pvc fence. The Grand Illusions Color Spectrum Black (L105) boards make the Grand Illusions Vinyl WoodBond Rosewood (W104) rails truly stand out. Why just choose one color when two can create this? And although it is beautiful, truly beautiful, the best part about it is that the homeowner doesn’t have to do anything but sit back and take it all in. 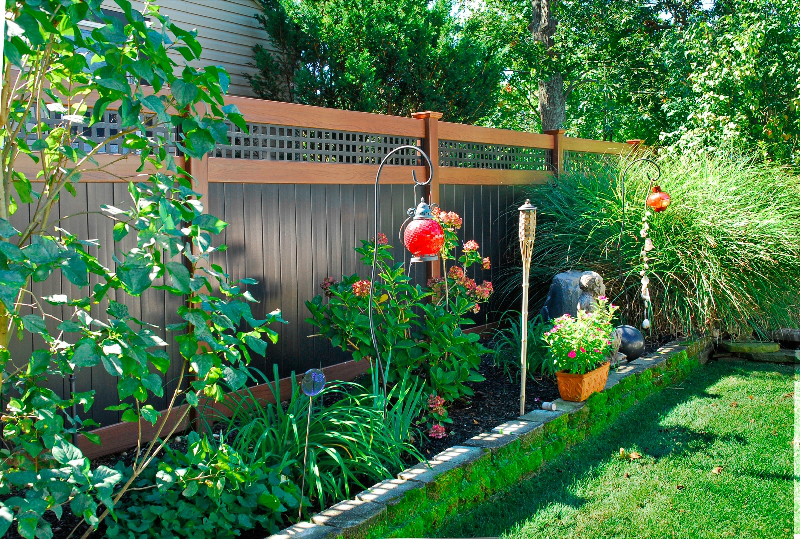 With vinyl fence, there’s no maintenance here. No painting, no staining, no backache, and no lost weekend! ‘Nuff said? 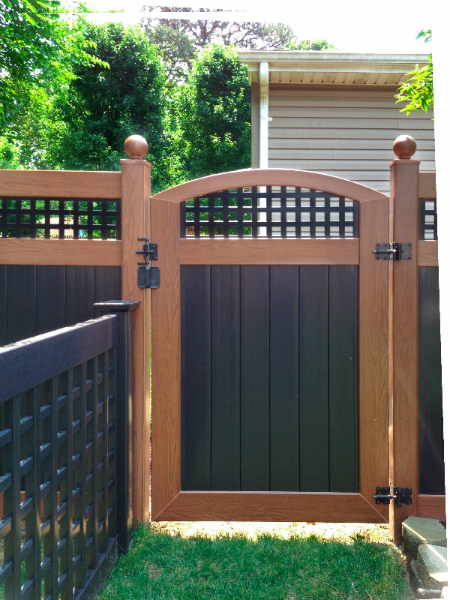 To compliment the full privacy fencing sections, the homeowner also had Old English lattice fence in Grand Illusions Color Spectrum Black (L105). It’s the perfect accent for the smaller garden. The Old English lattice doesn’t hide what’s behind it. It outlines it, creating an oasis within an oasis. The total picture, well, it’s just picture perfect. Try creating your own with the amazing Illusions Fence Design Center app! 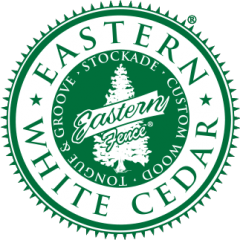 How did you choose your particular color/woodgrain for your property? We had been looking at PVC fences. When we first moved in, we got a white PVC plastic fence for the front of the house. This time around, in the backyard we wanted something that could weather well and not show the dirt. We also wanted a natural wood look. Although we were looking for something that wasn’t all wood. We thought that the black with the wood would just look better. We had looked at another style of woodgrain at Home Depot that didn’t have an actual grain. It looked fake. The Grand Illusions looks much more like real wood. Were you matching your house, home accents, etc? 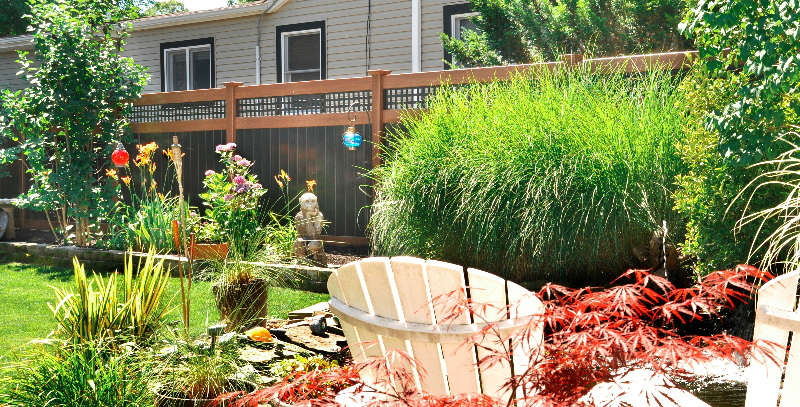 We’ve always wanted our backyard to be very relaxing. The look of the backyard now is just keeping the concept of being comfortable. To be a little bit more natural. We actually went and stained/painted our shed to match the fence. Are you satisfied with your Grand Illusions product? Yes. People keep coming by to take pictures of it. Can you give any other interesting facts about your Grand Illusions product and install? I think the funny thing was that we thought of the lattice fence as more of an oriental looking fence, but the fence installer told us it was called Old English fence! What do you like best about your Grand Illusions product? Low maintenance and the longevity. It will last so long. Everyone’s wood fences will will eventually weather and fall down and we’re so happy our Grand Illusions Fence will last the test of time. “The homeowners actually came into our showroom and saw the samples we had set up. They were immediately interested. I came to see them at their residence for an estimate and they decided on the Grand Illusions product line. They pretty much knew exactly what they wanted. At first when they told me what they envisioned in their backyard, I was taken back. Rosewood and Black with a white house and a white PVC fence in the front? I wasn’t sure it was going to work. But, I have to admit, they have a really good eye and it came out terrific. The fence in the front yard is white Illusions product as well. It’s amazing that when you go in through the gate into the backyard, it’s all Grand Illusions Color Spectrum and Vinyl WoodBond. It really pops. It’s a night and day difference. As usual, we didn’t have any issues installing the product. The great thing is, that there were a couple of minor blemishes on the woodgrain from the install that were easily touched up using the supplied touch-up markers. All we did was take the touch up marker, dab it onto the spots and then quickly wipe it with a wet cloth. Do that a couple of times and it’s almost impossible to see. It was a complete non-issue.